Sweet corn can be notoriously hard to digest. If you've ever cast a glance at what comes out the other end after a meal with lots of corn, you may have noticed a few yellow kernels left almost intact. Though it may look whole, these pieces tend to be just the shell of the corn, with much of the contents already digested. The little pieces of sweet corn that you eat are called kernels. These are the fruit of the corn plant, as well as the seeds. Each kernel has a protective coating. Your body lacks the digestive enzymes needed to break this coating down. However, the pulpy starch-rich contents are more easily digested. That means that some of the corn pieces seen in stools are only empty shells, according to Dian Dooley, associate professor in the Food Science and Human Nutrition Department at the University of Hawaii, writing on the MadSci Network website. Sweet corn contains high levels of starch. Like other starchy foods, such as pasta and bread, corn products produce gas as they break down in your system, according to the National Digestive Diseases Information Clearinghouse. Kernels may not release so much gas, as they don't break down properly. However, corn cereals or mashed corn may give off lots of gas. With some people, this might cause discomfort. In others, it simply means passing more gas until their gut becomes less bloated. Corn may cause digestion problems in people with certain bowel conditions. For example, if you have irritable bowel syndrome, or IBS, then corn may cause discomfort in the gut. In particular, an allergy to corn can trigger negative symptoms similar to IBS, according to the University of Maryland Medical Center. Similarly, the high fiber content in corn can present problems for people with conditions such as Crohn's disease, leading to poor digestion and uncomfortable symptoms, from cramps to diarrhea. 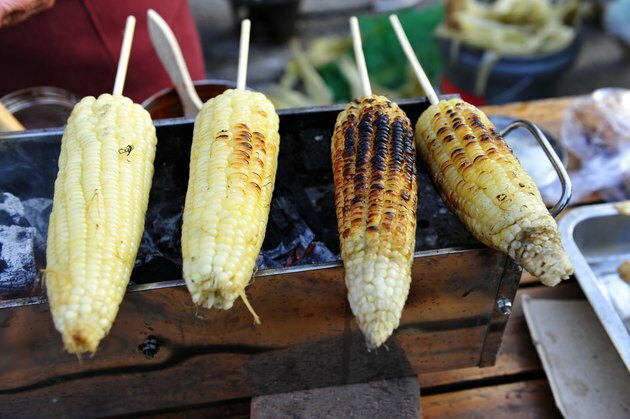 Like most vegetables, raw corn is harder to digest than well-cooked corn. Cooking softens the kernels and begins the process of breaking down the chemicals contained within. Mashed or creamed corn draws out more of the pulp and breaks apart the tougher external coating. In similar fashion, chewing your corn for longer helps break down the kernels before they even enter your stomach, according to Professor Dooley. Saliva enzymes begin the digestion process in your mouth and esophagus.